I have traveled quite a bit and while I have pretty much loved everyplace that I have been, there are only a few places that get deep into my soul in a life-changing sort of way. If you know anything about me at all you know that France is one of those places. But another place that I equally love is Hawai’i, otherwise know as the Big Island. Maybe it’s because I lived on Oahu for a couple of years as a baby and the spirit of Hawaii made an imprint on me, but I think Hawai’i is an absolutely magical place. During my family’s 10 day vacation I was astonished at the wild beauty and humbled by the rich Hawaiian culture. Most surprising was how much there was to do. 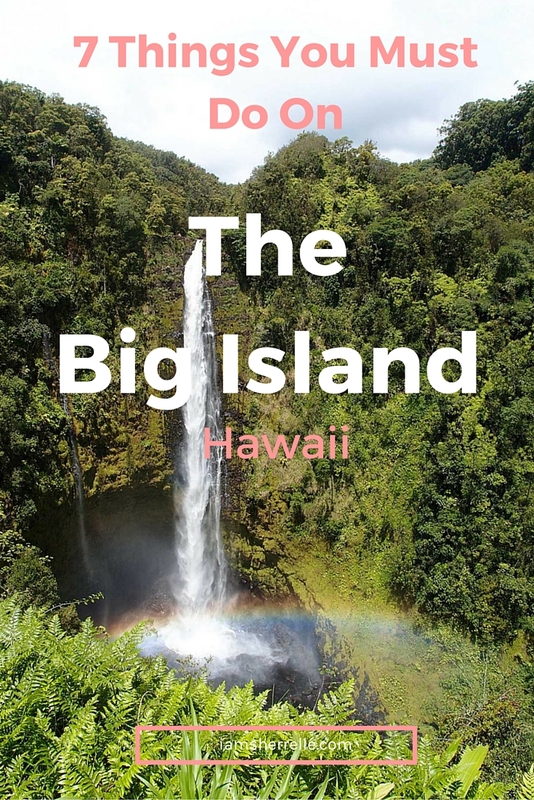 The Big Island is the largest of the Hawaiian islands and has several different climates, which makes for varied activities; this was my reason for choosing the Big Island as my family’s first Hawaiian experience. Of course the beaches are incredible and I will show you those in another blog post, but I think to fully appreciate the uniqueness of the Big Island you need to learn about the other riches first. Here are 7 things that you must do on the Big Island, Hawaii. 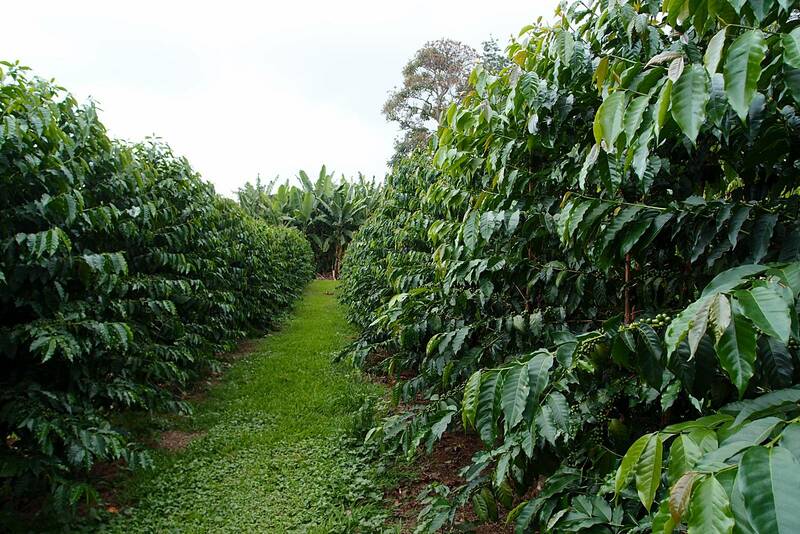 There are many coffee places to tour all along South Kona; we toured Greenwell Farms. We had a really nice tour guide and we learned a lot about how coffee is grown, harvested and roasted. I loved the tour and I don’t even drink coffee. My husband and son enjoyed the coffee tasting at the end of the tour. 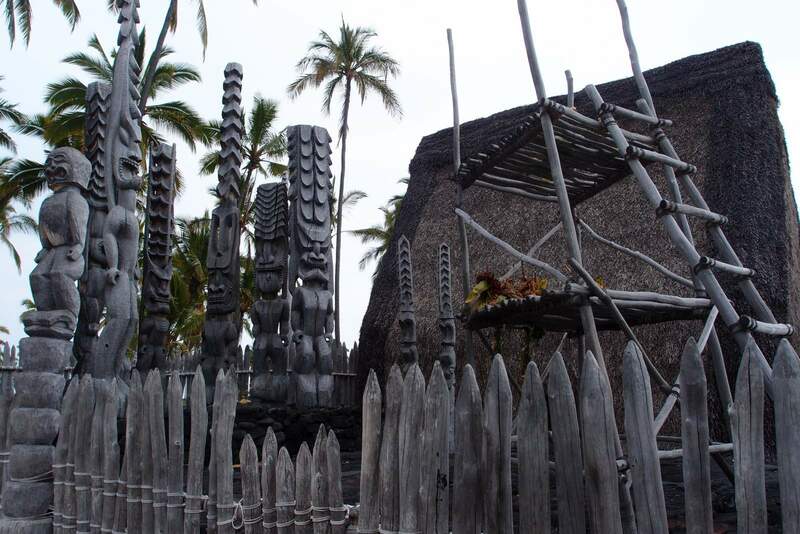 After the coffee tour we continued about 20 minutes south to Pu`uhonua O Hōnaunau National Park, or the Place of Refuge. 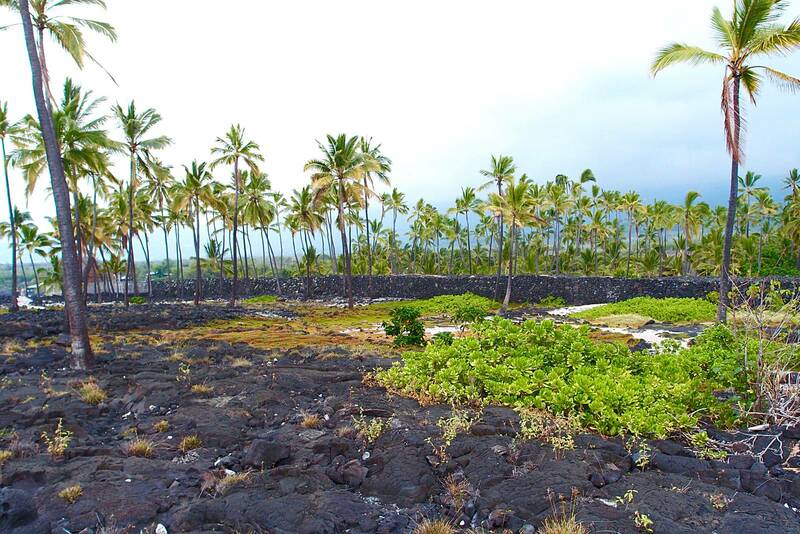 In addition to the historical, cultural and spiritual significance of the Place of Refuge, it is also great to hike around the lava field near the ocean and look in the tide pools. We saw crabs, fish, sea cucumbers and a sea turtle. If you have snorkel gear, you can go to the other side (called “Two Steps” by locals) and snorkel near the rocks. Tip: Wear hiking sandals like Keens or gym shoes because you need sure footing on the lava rocks. 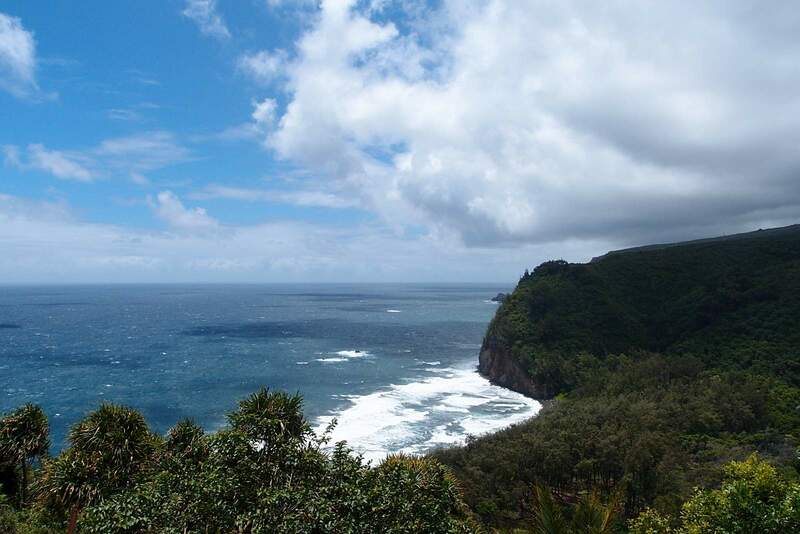 Pololu Valley is at the end of Highway 270; it’s a gorgeous lookout into a valley, but you can – and should! – hike down to the valley. The trail is pretty steep, but worth the effort. It took my family 25 minutes to hike down. The beach in the valley is black sand and very lovely. When we were there the surf was very rough surf although a few brave (or not very smart) people were in the water. There is also a tire swing there for play or you can bring lunch or snacks and just chill for a while. Most definitely you need to bring water; we left our water in the car and that was not a good idea. My son got sick from dehydration after hiking back up to the top – but then again it could have been because he tried to be a hero and run the whole way. Driving back down Highway 270 we stopped at King’s View Cafe in the town of Kapa’au for great pizza and ice cream. The restaurant is across the street from the original statue of King Kamehameha, perfect for a photo opportunity. Tip: The trail was all rocks and mud so be sure to wear Keens or gym shoes. We saw people with flip flops on and I know that they really regretted that – especially hiking back up! Did you know that the Big Island has a rich cowboy culture? More than a century old, paniolos or Hawaiian cowboys, are centered in the ranchlands of North Kohala and Waimea areas of the island. 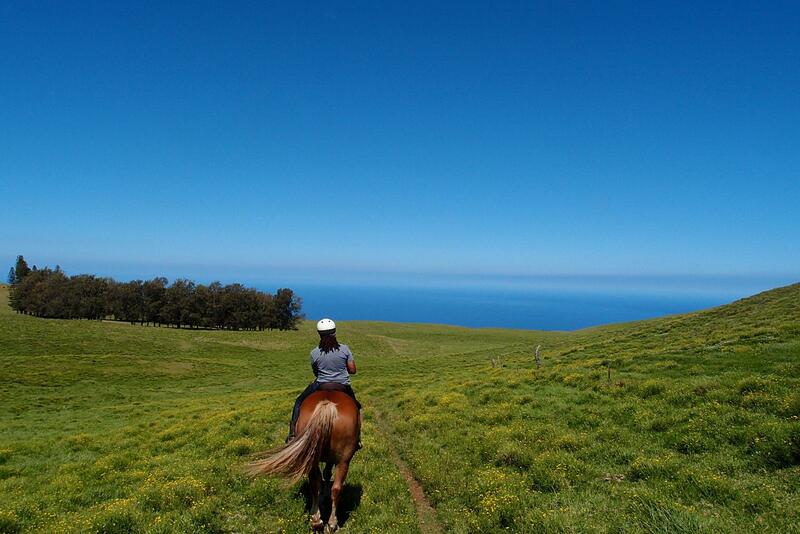 To experience a bit of cowboy life we rode horses at Paniolo Adventures, a working cattle ranch in Waimea. The scenery was amazing; we rode across rolling hills on the greenest grass that I have ever seen and the ocean was not far in the distance. The ride was so much fun; we were able to trot and canter – despite the fact that everyone in our group (except for me) were novice riders. Yes it’s touristy, but it’s something that you must experience at least once. This was the only request that my son had of the trip, to eat a pig cooked in the ground. On a recommendation from TripAdvisor, we booked a lua’u at the Mauna Kea resort and it was very nicely done. In addition to a large buffet in which my son ate enough for all of us, the show of hula and fire dancers was quite entertaining. The resort has a big light that attracts mana rays so after dinner we watched them swim in the bay. Tip: Get there early enough to see the pig unearthed from the ground. 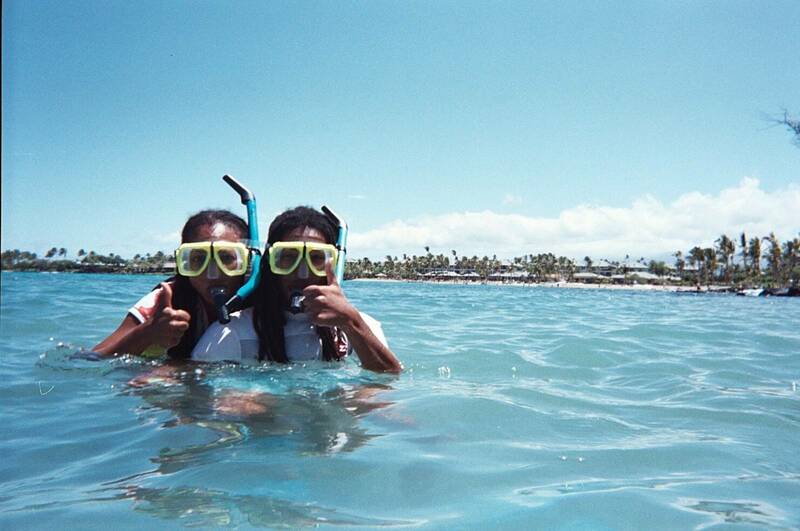 We had never snorkeled before, so I planned to book us on a snorkel tour boat, but on the day we arrived there was a very unfortunate accident; a 15 year old boy from New York was swept out to sea and never found. This happened where the tour boat anchors to snorkel, so it just didn’t feel right to go there. Instead we rented snorkel gear at Snorkel Bobs in the Mauna Lani Shops and had a ball snorkeling on our own from the shore. We rented the float belts too. The float belts are not necessary; they are not a PFD and won’t save your life, but they were a psychological crutch to ease our mind about being in the ocean after the accident. Be sure to look up every once in awhile to find your snorkel buddies; I got pushed by the wind and I “felt” that I was out past everyone. When I finally looked up I was right; I was very far from the shore! I swam back to shore very quickly. After that I felt better snorkeling while holding my daughter’s hand so I knew where she was. We also had fun viewing the fish together. Most travel books will not recommend visiting Volcano National Park in one day, but we did. At the time of our visit the lava could only be seen from the air, so there was no need to see the volcano at night. There are several ways to travel there; we took the Hilo route. We left our house in Hawi at 7:00 a.m. and stopped in Waimea for breakfast at a local spot, Hawaiian Style Cafe. 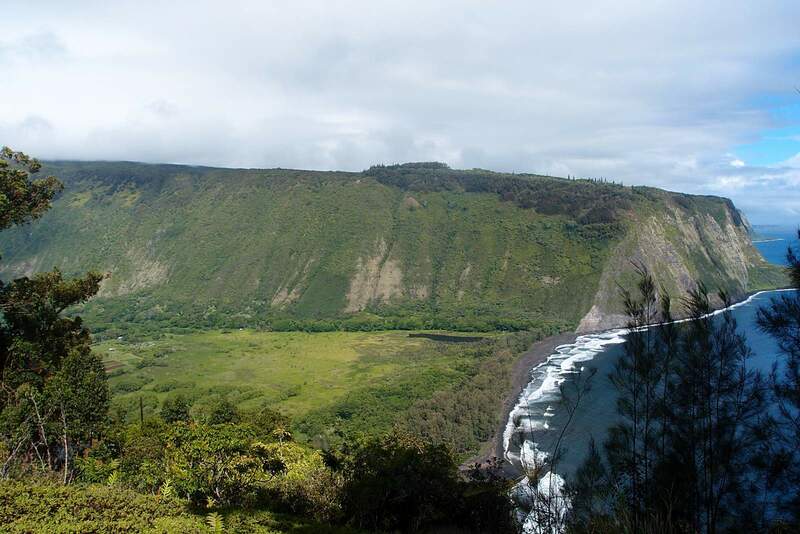 After breakfast we continued on to Waipi’o Valley Lookout where we gaped at the majestic scenery. It is possible to drive down with 4 wheel drive, but we didn’t have the time (or the nerves) so we took photos and kept going. Some ways down the road we stopped at Tex Drive-In for masaladas, Portuguese donuts brought to the Big Island over a century ago from Portuguese plantation laborers; they are now a part of Hawaiian culture. Honestly we were too full from our huge breakfast to eat them, but my daughter insisted – she never met a sweet she didn’t like. Tip: Tex Drive-In is a good place to use the bathroom. 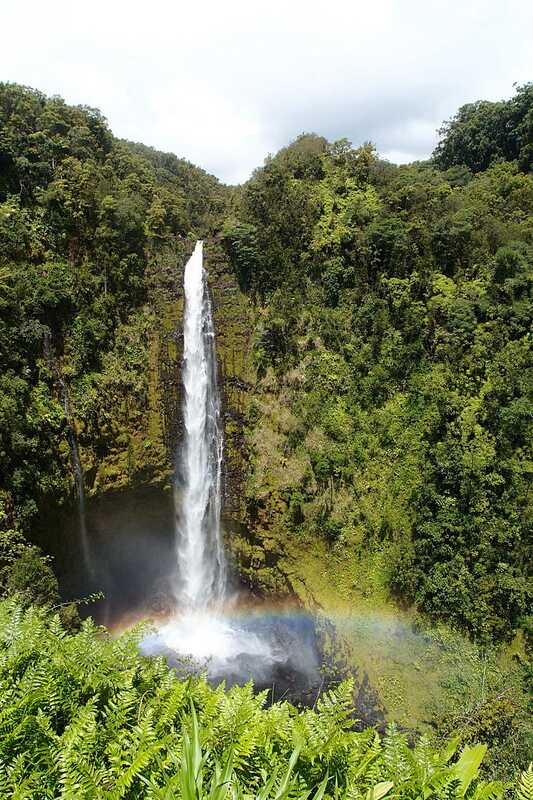 We continued down the coast, stopping at ‘Akaka Falls. It’s beautiful and a must-see along this route. We walked the long trail around and were there about 45 minutes total. Continuing down the coast, we took the 4 mile Scenic turn-off and there are some lovely views there. We arrived at the volcano park about 1:00pm – and it was rainy and cold, a totally different climate than the one that we had left in North Kohala. The jeans, long-sleeved shirts, jackets and sneakers that we wore were necessary. We had umbrellas too and used them. Tip: It was hot at the waterfall and cold and rainy at the volcano, so it’s best to be prepared for all kinds of weather. 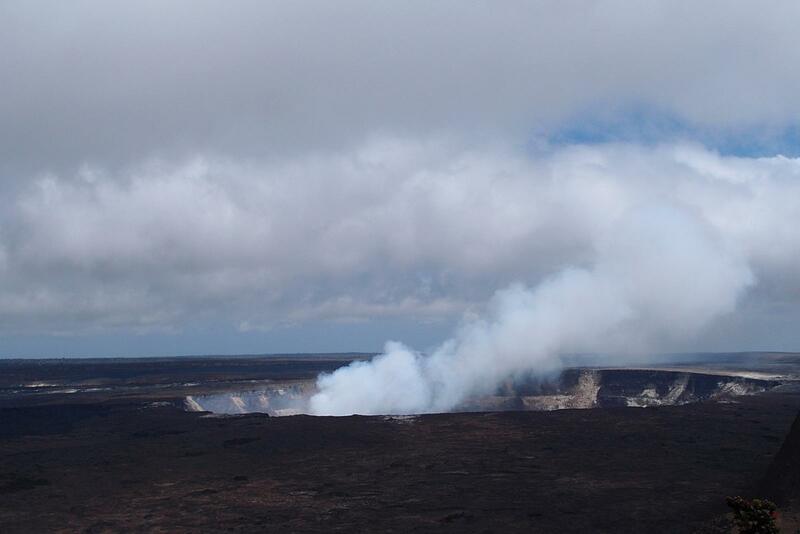 My daughter was miserable in the cold rain, so instead of hiking we drove to the steam vents, Jagger museum and the lookout of the Halema’uma’u Crater in Kilauea Caldera. After the crater we drove to the Thurston Lava Tube, parked the car and walked through it. That was a pretty cool experience. Now it had mostly stopped raining and had warmed up a bit, so we hiked down to the Iki Crater floor. There is a 1.5 hour/4 mile walk available, but the entrance across from the Thurston Lava Tube was better for my family that day. It was a about a 25 minute walk down through the rain forest and out onto the crater. Stepping onto the crater was so surreal – we felt like we were on Mars (if Mars was made of lava)! We were the only people there. 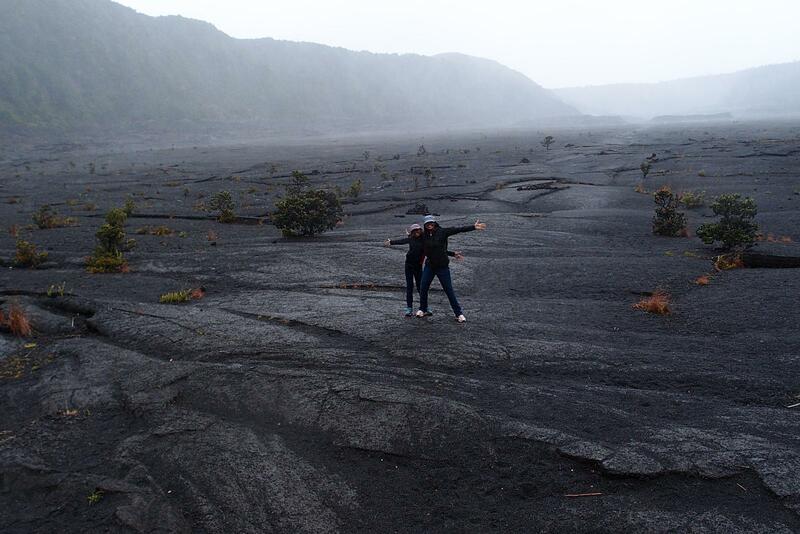 The ground was warm and steamy from the lava, so it was kind of scary knowing that we were standing on an active volcano but the crater was one of my favorite things that we did in Hawaii. The hike back was uphill of course. Tip: Wear sneakers; we all got pretty muddy. We left the park about 5:00pm. There is more that we could have done, but I could tell the kids had had enough. We ate dinner in Hilo and then drove straight back to Hawi. It was imperative to arrive home before total darkness because part of the drive is on a winding mountain road; there are no street lights and it is pitch black at night. We arrived back in Hawi at 8:00 p.m – just as darkness was falling. It was long day for sure, but we loved both the drive and the volcano. Our first vacation on the Big Island was fantastic; it was one of our best vacations to date. I can’t wait to go back! Next up: the best beaches on the Big Island. Come back next week or subscribe for blog updates so you don’t miss a thing. Aloha Sherrelle. I just happened upon your website while looking for a place to hike when I travel to Antibes this Spring. And then I saw that you love “Da Big Island” too! My husband and I live on the Big Island in the Winter and agree. It is amazing. I love and live to snorkel and hike here. Hence, my search for a hiking spot in Antibes. I will be there for a two week French immersion school. And I am excited. Thanks for sharing your adventures. I have enjoyed reading them. And will definitely do this trail in Antibes. 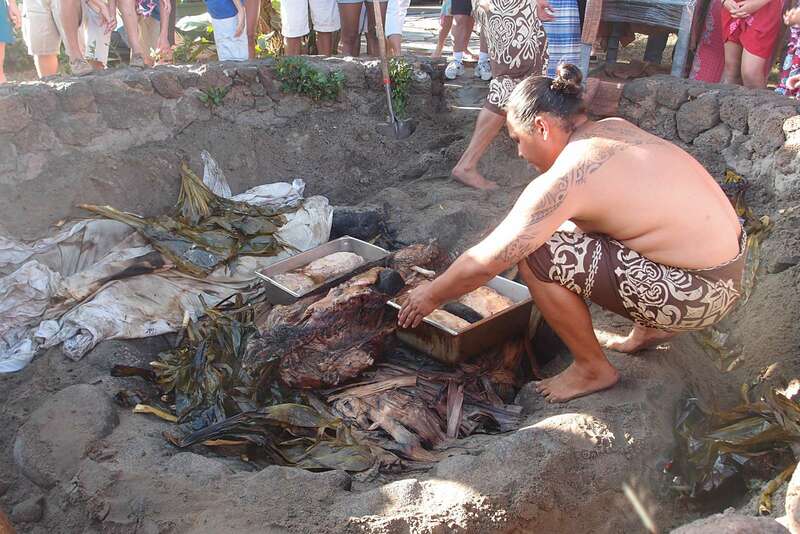 I experienced a lua’u on Oahu years ago. Sadly, I was early pregnant and nauseous, so I could barely eat a few nibbles of the food. At least I was able to enjoy the dancers and sunset after our meal. Oh yes, the sunset – it was spectacular!